Employees time off rules change all the time. Collage makes moving your employees from one policy to the next a simple and painless process. The first step to changing your employees PTO policy is to navigate to the time off tab of the employees profile. Under the employees time off balance you will see their current time off policy displayed. To change the employees time off policy, click on the three dots next to the time off policy name. Then click Move to a different policy. You will be redirected to a page where you can select the new policy you want to move the employee to. Do this by clicking on the drop down, and selecting the new policy from the menu. Next you will be asked to select an effective date. This is where you select when you would like the employees time off to start using the new policy rules. Select the dropdown menu, and then the effective date you wish to be applied. Start date: This will date the change back to the beginning of the employees employment. Time off will be carried over and accrued according to the new rules (if applicable). Start of time off year: This will date the change back to your policy start date for the current year. Time off will be carried over and accrued according to the new rules (if applicable). Next accrual period: This change will be effective the date of the next accrual, and will not effect the employees current balance. Any accruals or carryover rules configured will take effect with that policy's next accrual. Note: Time off requests and manual adjustments will remain unchanged when moving an employee to a new policy no matter the policy or effective date. Once the new policy and effective date have been selected a chart will be generated at the bottom of the screen. The chart will display what the employees current balances is, and what it will look like once the change has been made. If you set the effective date to Next accrual period, you will not see any changes being displayed. This is because the changes are being made to the next accrual and not effecting the current balance. If you are moving the employee to a policy with an Unlimited time off type, it will be displayed as unlimited in the chart. 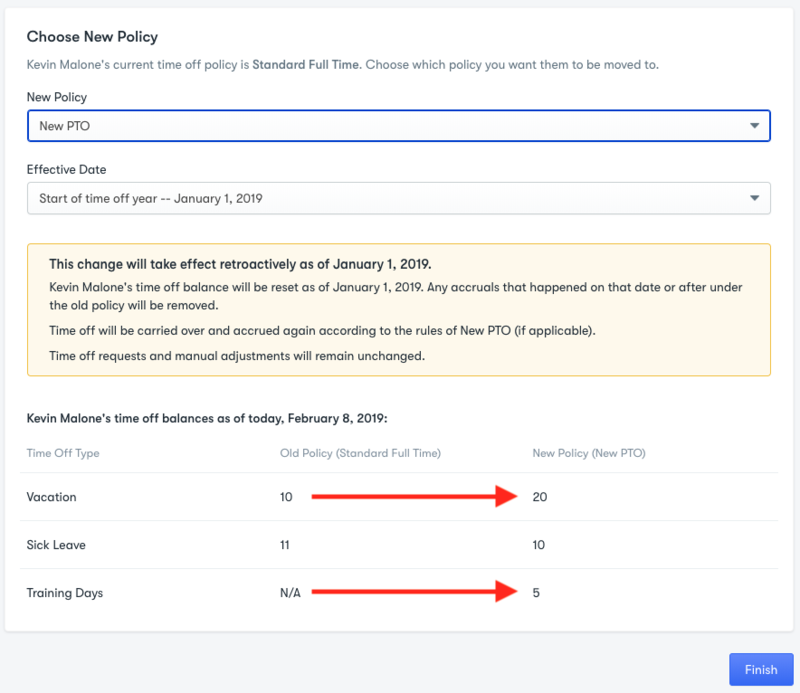 Note: If the employee is in a policy without a time off type, and is now gaining the time off type, it will be displayed as N/A under the old policy column. 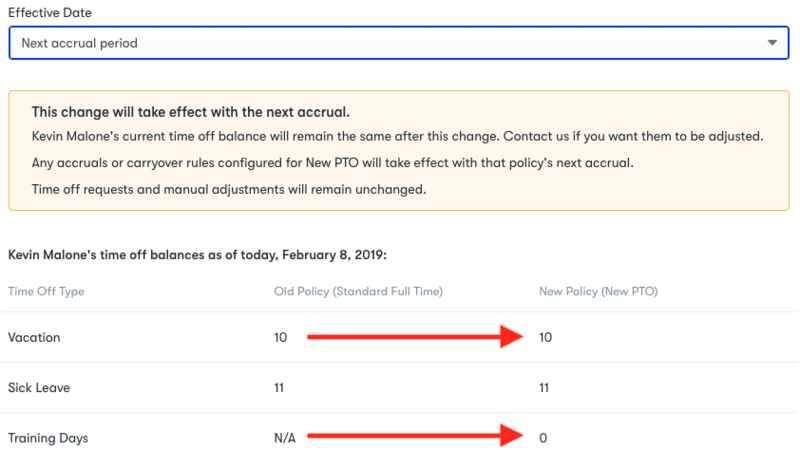 If the time off type is being removed, it will be displayed as N/A under the new policy column. Once you have clicked finish at the bottom of the page, the change to the time off policy will be saved. You will be redirected to the employees time off page where you will be able to see the changes. If you have any trouble changing your employees time off policies, please reach out to our support team at Support@collage.co or through the live chat on the bottom right corner of your page.